Imagine you’re struggling with your calculus homework. If you really needed help you might have called your friend from class. But students today have a new option. Today, more than 100 million students are logging into Brainly to use the wisdom of the crowds to do their homework. Brainly is a platform for students around the world to help each other with their homework. The site is geared mostly to middle and high school students, though college students use the platform too. Any registered student can post a question to the platform, and other students will post answers in reply. Brainly incentivizes users to respond to questions through gamification and a points system. Users need to use points to post a question. The more points they use, the more quickly their question will be answered. Users gain a basic number of points each time they log into the platform. However, users gain even more points by answering questions. Users gain an additional points bonus by giving the best answer (as decided by the question asker)[i]. In addition to needing points to ask questions, users are incentivized to provide good answers due to gamification. Users are ranked based on the number of points and “best answers” they have earned on the site. Each user is also given a title (beginner through genius) based on these factors. 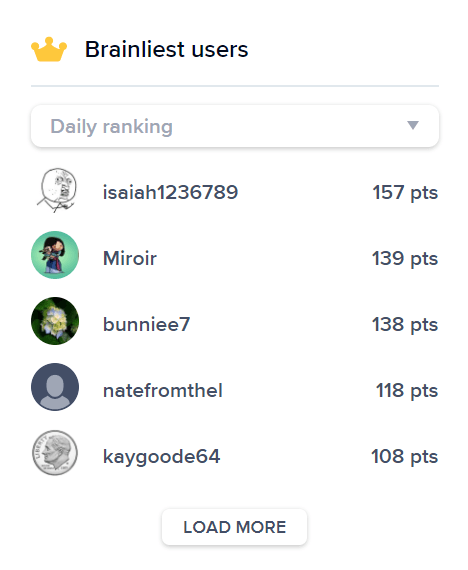 This ranking and points system incentivizes users to both engage on the site, but also give correct answers rather than posting incorrect content. 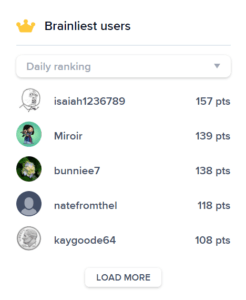 Brainly further verifies content is correct and appropriate through the use of moderators (also users, who earn points by moderating the site). Brainly has done an incredible job of tapping into the preferences of its target market. Today’s middle and high school students grew up with technology and social media platforms, so they are used to the idea of going online for help with all of their needs, including their homework. Further, Brainly’s gamification and ranking system ties into students’ need for social validation. This is a powerful incentive tool to make sure usage on the site is both consistent and of high quality. This understanding of the target market has led to incredible user growth so far for Brainly. The platform serves 100 million monthly unique users (in comparison, Twitter had 330M monthly active users in the fourth quarter of 2017[ii]), and has 30 million answered questions on the site. Brainly is active in 35 countries, with most of its growth so far coming from outside of the US (Brainly was founded in Poland)[iii]. Though Brainly has done a great job with its user base, the question remains whether it can successfully translate these users into profits. So far, Brainly has made limited steps towards monetization. It recently offered a subscription service – Brainly Plus. For $24-45 a year, users can get access to verified answers, avoid ads, and get faster answers to their questions. However, it is unclear how many users have converted so far, and at such a low price point, Brainly would need significant conversion to paying customers. Further, given that most of Brainly’s users are K-12 students, it will need to find an efficient way to get users’ parents to pay, and this separation between the user and the payer may lead to lower conversion rates. Brainly’s captive student audience should leave it well positioned to succeed as a crowd-sourced education solution. 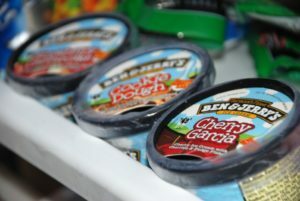 However, it will need to find a way to profit from its user growth to date in order to succeed long-term in the space.